Pine Cliffs is a luxury resort in a naturally beautiful location, 800 metres from the Atlantic beaches. It features a wellness centre, 2 swimming pools and a 9-hole golf course. 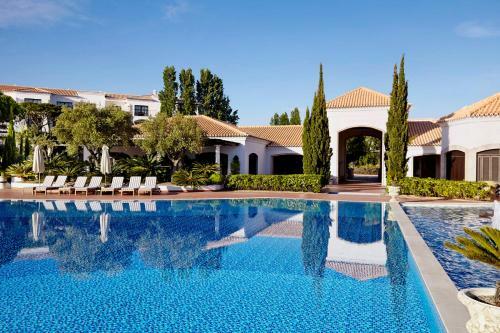 Located in Albufeira, Akisol Albufeira Sun II offers an outdoor pool. The property is 1.1 km from Fisherman's Beach and 1.2 km from Old Town Square. Accommodation will provide you with a TV, a balcony and a seating area. Situated in the Albufeira City Centre district in Albufeira, this air-conditioned apartment is 700 metres from Albufeira Marina. Guests benefit from balcony. Free private parking is available on site. The unit is fitted with a kitchen. Located in Albufeira’s historic centre, just a 3-minute walk from Fisherman's Beach, Polana Residence serves a continental breakfast buffet in the bright breakfast room. The air-conditioned rooms come with a satellite TV.